Cataloguing the collection began at the beginning of May. The material was purchased in December from the executors of George Sassoon, the only child of Siegfried Sassoon, via Sotheby’s auctioneers. The sale inventory compiled by Sotheby’s has provided enough detail to allow the identification of the main groups, or in archival jargon ‘series’, into which descriptions of the collection will be arranged. Ideally the archivist aims to preserve as much of the ‘natural’ or ‘original order’ of the material as possible whilst also creating a logical structure of ‘categories’ that allows the researcher to readily identify material of relevance to their work. 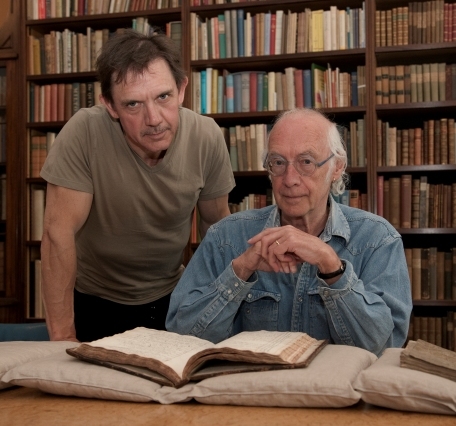 David Bamber (left) and Roger McGough during the recording of 'Poetry Please' in the University Library. A team from BBC Radio 4’s ‘Poetry Please’ visited the Library in April to record two programmes based on our holdings of manuscript poetry. The second of these programmes, due to be broadcast on Sunday 6 June at 16.30 (and repeated at 23.30 on Saturday 12 June), focusses exclusively on the writings of Siegfried Sassoon, as represented in the Sassoon manuscript collections here. The presenter, poet Roger McGough, was shown treasures from our recently-acquired archive of Sassoon’s papers, MS Add. 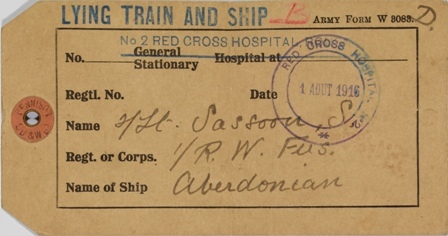 9852, together with items from Sassoon collections accessioned in earlier years. Actor David Bamber (whose television roles include Mr Collins in Pride and Prejudice and Cicero in Rome) voiced a selection of Sassoon’s poems, as well as the ‘Soldier’s declaration’, Sassoon’s 1917 statement protesting against the continuation of the First World War. The recording took place in the Library’s Sir Geoffrey Keynes Room, a fitting venue given Keynes’s close links with Sassoon and involvement with the publication of many of his small press poetry editions, from Vigils onwards.